I love delicious tasting recipes. I don’t care for long ingredient lists- simple is good! Directions: Rinse and drain chickpeas. For a single serving, take 1/2 cup of cooked chickpeas and set aside in a small, but deep, bowl. In another small bowl, mix the nut butter and pure maple syrup together. Scoop the PB + maple syrup mixture onto the chickpeas and mix well with a spoon. Serve over top of a soft piece of bread, in a wrap, on a salad, or eat it alone! I tried this on toast, soft bread, and alone and I liked it best alone, then on soft bread, and didn’t care for it on toast too much. It may also be good on the right kind of salad too! Note: I used canned chickpeas, however if you cook your own, you might want to add a pinch of sea salt as the canned chickpeas have a lovely salty flavour to them. Nutritional Information: (Serves 1): 260 calories, 9 grams fat, 6 grams fibre, 9 grams protein. Those are some amazing nutritional stats, eh? It makes for a quick and healthy morning or afternoon power snack! I came up with this simple recipe when I was making my first batch of dessert hummus– that recipe will be coming shortly too! I know it probably seems very strange to mix peanut butter and maple syrup and throw it onto chickpeas (trust me, I thought so too! ), but it honestly tastes AMAZING! I must ask, what is nut butter not good with? I have realized that chickpeas are very versatile and will basically adapt to any flavour that you mix it with! Do you love any strange combinations of foods that you think just taste amazing but others may cringe at the thought? Check Out These OSG T-Shirts For Breast Cancer Charity! Hello OSG readers! My name is Kath and I will be walking 60 miles in 3 days for the Susan G. Koman Breast Cancer Walk in San Diego November 19-21, 2010. I need to raise $2,300 to help fight breast cancer! 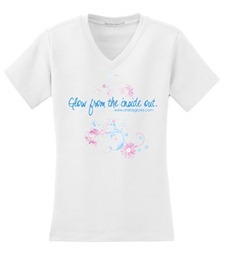 Angela has stepped up to support my fundraising efforts by working with me to create a t-shirt design for Oh She Glows. 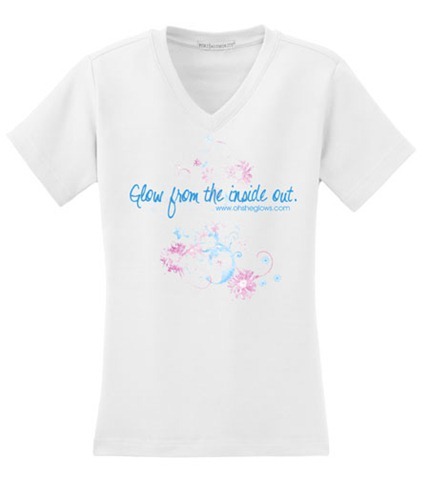 Please visit – www.icostore.net/katherine3day to purchase Angela’s design (under the category “She Glows”) or one of the many other designs available along with maybe different apparel styles or accessories. Thank you for your support for this great cause! Tomorrow AM, I will be addressing your questions about whether I have any desire to do another triathlon. To prep you for the discussion, here is the 3rd graph installment! Eric and I are hoping to get out for a short bike ride tonight to loosen up our legs. Have a great night! hahaha…that graph is amazing! love it. Um….WOW, that looks delicious to me! I love chickpeas – I went through a stage where I had a half a can with my lunch – straight up! I can’t wait to give this a try. Was eric athletic before you met him or did he become so because of your time to-ge-tha? And are you vegetarian for health or for I love the furry creatures reasons?? He played football and basketball when I met him in highschool. I’m a vegan for lots of reasons…animal welfare, health, environment, etc. What a unique recipe! Love it! Oooo if the graph is to be believed it’s looking good for another tri!! I do hope so! The chickpea recipe looks delicious. You are so right, sometimes the simple recipes are the best. I will so have to try this, it looks like a yummy snack. Lemme know what you think if you try it out! have you ever seen those chocolate chippers with garbanzos in them? it’s in the cookbook Deceptively Delicious. We tried ’em out . . . not a huge fan. Oh that recipe looks amazing! TU! That recipe looks dreamy! Quick + easy is the way to go, especially if they are delish! Ooooh these look wonderful!!! I must try them asap! I am going to go try that right now. It looks like it would be very filling. Another great way to use chickpeas. That is such a funny combo. I’m not the biggest fan of chickpeas, so I don’t know about actually trying it. 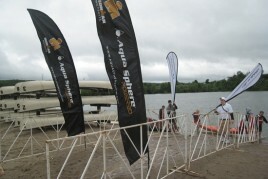 Are you thinking about doing another triathalon? One of my go-to meals is chickpeas (sometimes cinnamon roasted) over quinoa or millet with a peanut butter (or almond butter) and maple syrup sauce drizzled over the top! Nut butter/maple syrup is my standard pancake topping. It’s also great to dip kale chips into!!! Try it! I sometimes thin it with a little hot water. I still have not tried kale chips…hoping we get some kale in our CSA this week! It sounds SOOO strange! And yet….I feel like I must try it! Personally I’ve always loved sweet pickles and peanut butter on a sandwich. Sounds gross, but is pretty darn tasty! I’m with you. And sometimes things you think won’t work totally do. I love garbanzos because they adapt to anything. I can’t imagine how that flavor combination works, but I’ll trust you. I think of chick peas as a savory food, but I can see how it would blend well with stronger flavors. I am curious to see your graph on day 3 and beyond! candy covered chickpeas….wow, that might work! You do such interesting things with food. This looks amazing! I’ll definitely have to try it out :) What do chickpeas taste like? That is a very hard question to answer…I really don’t know how to describe them! They have a very light flavour and are quite dense…they will basically adapt anything! YUM! it just is NOT possible for nut butter to taste bad on anything…simply not possible. Love the graph, must have missed that original post. Can’t wait to hear what you have to tell us tomorrow. so funny that you posted this because i came across this recipe for zuchini hummus. i thought about how much you love hummus. : ) anyway, my hubby has lots of zuchini growing in his garden and i wanted to find something cool to make. 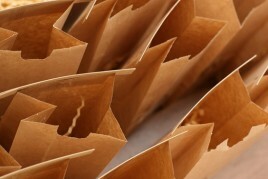 i found this recipe by gena at choosing raw. OMG so good and so healthy! fresh veggie over canned. i added minced garlic to the recipe too. glad you posted so i could pass it on! Weird Q, but what kind of canned chickpeas do you generally get? Ermm… This sounds delicious indeed, but my mom would be giving me weird looks the whole time. I have a question – when other people look at you strangely or make comments on what you eat (just yesterday my sister dissed oatmeal: “It’s disgusting nothing-tasting mush.” And just before that she had proposed to eat McD’s for breakfast. I looked at her and told her not to diss it and that I don’t like Mcdonald’s either, but clearly I cared more than she did when she said that “If you don’t like it then don’t eat it.”) how do you deal with it? I find it especially hard since it’s usually my family and friends who witness my weirdness (again, another anecdote: I went separate ways with a few friends once when they met another friend in the hallway, and when they were leaving I sort of went in the same direction, because eventually we had to turn opposite ways as well. I heard loud laughs and the words “salad, every day.” The only person I know in our friendship group who eats salad everyday is me.) and especially when my mom, who is usually in charge of what I eat, is the one making comments. Do you have any advice to deal with these kinds of comments? First off let me say that I have not been reading OSG recently bc I’ve been really busy the past month (I quit my job, moved, and started a new grad program… plus I’m finishing planning my wedding!) 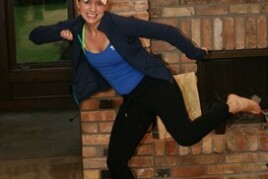 I have missed your blog! Anyway, I ran out of yogurt (my go-to breakfast) yesterday and I was like I remember when I used to read OSG every day and Angela made those vegan overnight oats all the time… so I tried them. I was super skeptical that cold oatmeal would be weird but OH. MY. GOODNESS. SOOOO yummy! The point of this story is that I need to trust Angela, even when she suggests something totally wacky like chickpeas and maple syrup. You would like my dreamy peanut butter spread http://chicagomarathonval.com/2010/05/22/this-dip-will-change-your-life/ which is made from the same ingredients. It’s soooo addicting that I couldn’t help myself the last time I made it and ate almost the whole thing in one sitting! And today for a snack I ate chickpeas drizzled with agave. Yum! Sounds good I will check it out! I’m not gonna lie those chick peas look Oh so wrong. I guess I’d have to try it. 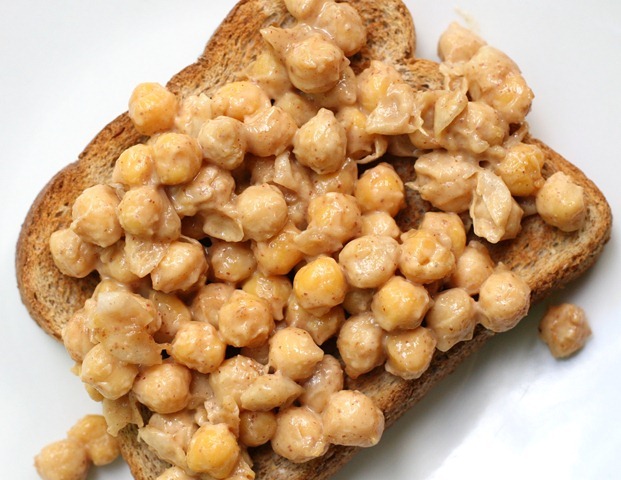 I never would’ve thought to combine chickpeas and peanut butter! do you have a good hummus recipe? i like it really creamy and really lemony… i’ve never been a chickpea fan but i will try this just because you said so! do they take on the flavor similar to what spinach does in fruit smoothies? Your graph killed me!! My in-race graph would be based entirely on the elevation of the course. I felt like the king of the world flying down the Sixth Line hill on the way back and thought I could keep going forever! ;) We need to find a race that’s all downhill. you dont know what you are missing….gahhhhhhh! Very interesting recipe. There are a lot of chickpea recipes coming out lately. I love canned chick peas. Usually when I use canned beans I give them a rinse under the tap so that I can wash off some of the preservatives they put in the cans. might be three of my favourite things put into one… maple flavour, chickpeas, and nut butter… genius. Those chickpeas look so good! I’m willing to try new, interesting flavor combos like that. I will definitely try that when I get home- there is NO peanut butter here in Hungary! Can you believe that?! no peanut butter? What about other nut butters? Fist, congrats to the tri-a-tri! I think you guys were awesome and it was really inspiring to read about. That’s graps is hilarious btw, I sooo know the feeling of ups-and-downs! I have to try this! 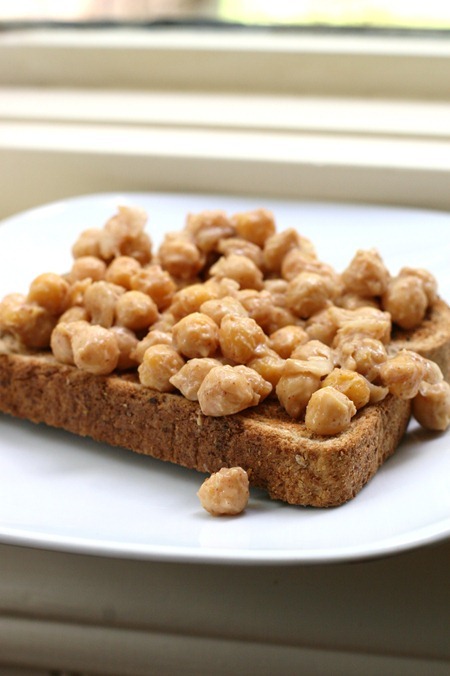 I love chickpeas and peanut butter so much separately…I never would have thought to combine them. YUM! Can’t wait to try the chickpeas. My favorite odd snack is yogurt with any kind of nut butter. I take a spoonful of the nut butter and dunk it in my yogurt cup that way you take a bite you get the fruity yogurt and the nutty taste. It works with pretty much any flavor yogurt. How do you calculate your nutritional stats for all your recipes? Haah! I love your chart. 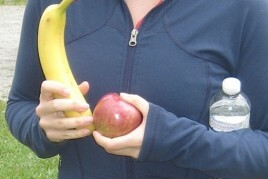 I had such varied thoughts during my triathlon training/race, too. But I think I liked it! I never would have thought to mix chickpeas and peanut butter together. I’m a bit skeptical, but I may have to try this one. Great blog – came across it today! 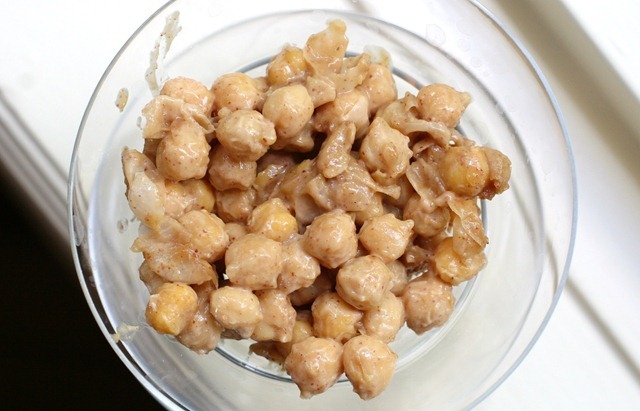 Have you seen the recipe for pumpkin chickpeas a la Mama Pea of Peas and Thank You? 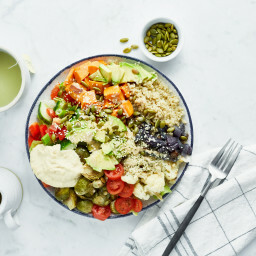 I’m not sure if you’re allowed to link to other blogs that aren’t your own, but this recipe is delicious… http://peasandthankyou.com/2009/10/27/20-questions/ Also, she’s got a great recipe for Apricot Cinnamon Almond Dessert Hummus if you’re in the market! Yes I have tried it before (pumpkin chickpeas) and they are AmAZING! 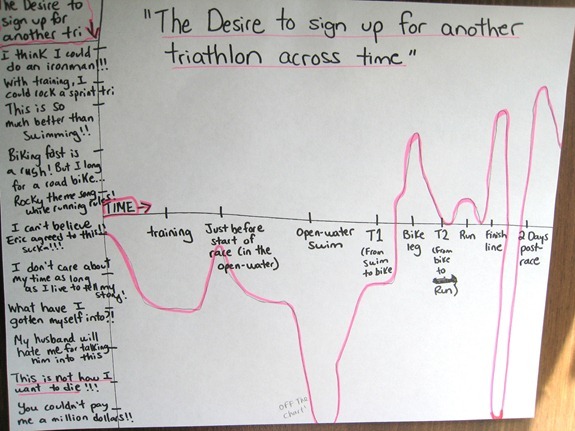 Aww, I love the triathlon graph, haha! I finally got to try some glow bars – they came in a package I won from LiveWell360! Sooooo yummy! Glad you like the bars! Congrats on winning the gift package…so lucky! Wow! 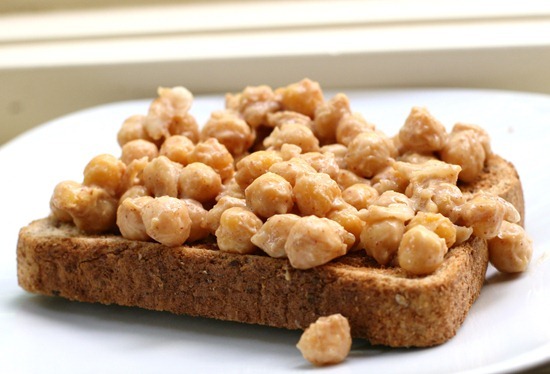 The chickpea toast looks fantastic! I will be definately be using that as a recovery snack in training. Dumb question – do you actually heat/cook the canned chickpeas first? Or can you just use them straight out of the can? Nope, I just rinse them very well (and drain) and then they are ready to roll. Weird food combination that actually tastes amazing: Grilled cheese dipped in corn syrup. Strange, but so good. HUH! I would have never ever thought of chickpeas and pb!!! What a great idea! I will try this!!! I whipped this together to take to work this morning, and to my surprise (I’ll admit! ), it was AMAZING! My boss’ assistant just tossed by container I brought to work! She didn’t recognize the stuff! Now I’m sad. I’ve tried this and I loved it! I made the PB and chickpeas yesterday. I used chocolate peanut butter and rolled them up into little raw cookies balls and ate them for a snack. So good and filling! So I finally tried this recipe and I love it! Definitely a new favorite snack/lunch recipe. I used Justin’s Maple Almond butter instead of peanut butter. I HIGHLY recommend it! Thank you for all the wonderful recipes Angela! Looking forward to purchasing your cookbook when it comes out! 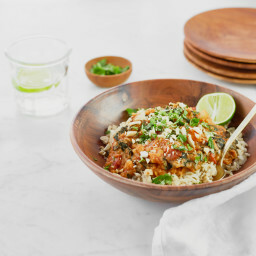 I’ve been sifting through your recipes (a daily routine after only recently discovering your site) and was so happy to find this one! I’m all about trying any and all healthful vegan recipes, especially if they have the potential to raise an eyebrow. It just so happens that I had bread, peanut butter, chickpeas, and maple syrup handy, so I made myself an open face sandwich. Delicious + quirky = brilliant. I was a little liberal with the maple syrup because the peanut butter was a little too firm after sitting in the refrigerator. An extra teaspoon helped create a more malleable spread. Thank you! I’m off to get lost in your recipes again!